Hello everyone, and Happy Thursday to all! 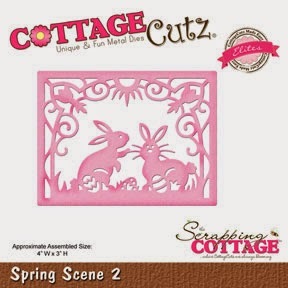 Today I wanted to share with you all the CottageCutz Spring Scene 2 die. I love this sweet bunny die, they are absolutely darling. I cut them out using design paper in a blue polka dot pattern. Kept it super simple, and just layered it on a swirl white card stock. For the frame under it, i used CottageCutz Oval Doily & Frame Die, and just cut it in half to place one piece at the bottom and the other at the top. The Border around the next layer is a punch around the page. and then below that is the back side of the Polka Dot design paper, its a chevron print. Lastly I added some half backed dots in white to embellish my card. This was a super simple card to make, as there is no sewing, and really no embellishments. Thank you for looking and for all your wonderful comments! Beautiful card. Love the bunny die cut. I like this two color combo. You've combined them perfectly, Cheryl.